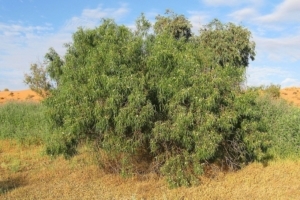 Compounds produced by the creosote bush, a desert shrub common to American Southwest, exhibit potent anti-parasitic activity, according to research conducted at the Skaggs School of Pharmacy and Pharmaceutical Sciences at the University of Colorado Anschutz Medical Campus and the University of California San Diego. The plant could serve as a treatment against two deadly parasites responsible for Giardia infections, Giardia lamblia, and the amoeba that causes an often-lethal form of encephalitis, Naegleria fowleri. Standard treatment for both infections involve antibiotics and anti-parasitic drugs, according to researchers. The findings, published online this month in the journal, PLOS Neglected Tropical Diseases, and announced in an August 16 press release, may give researchers the chance to widen their arsenal of antimicrobial agents effective against deadly parasitic infections. The World Health Organization estimates giardiasis, a diarrheal illness, is linked to approximately 846,000 deaths worldwide each year. Infection usually occurs through ingestion of contaminated water or food. Though rarely lethal in the United States, it's estimated there are more than a million cases of giardiasis in the country annually. Infections due to N. fowleri, sometimes called the "brain eating amoeba," are much less common than Giardia. However, it is a far deadlier parasite that is found in warm fresh waters and infects the central nervous systems of their victims through the nasal passages causing lethal brain damage known as primary amoebic meningoencephalitis (PAM), said Dan LaBarbera, PhD, principal investigator and associate professor of drug discovery and medicinal chemistry at the CU Skaggs School of Pharmacy. Due to its rapid infection cycle and high mortality rate, the Centers for Disease Control and Prevention has been given special approval to provide the drug miltefosine to clinicians as a treatment option for N. fowleri infection. But it is still not FDA-approved and has limited availability in the United States. This new compound potentially provides a less expensive, more effective treatment option. Scientists from CU Anschutz and UC San Diego collaborated as part of the Skaggs Scholars program, which matches investigators from Skaggs-funded schools of pharmacy with complementary expertise to discover potential drug breakthroughs. UC San Diego scientists provided expertise in parasitology, while the CU Skaggs School of Pharmacy provided expertise in natural products, compound libraries, and active compounds from plants. The researchers investigated these tropical diseases because of their occurrence in Mexico and South America and found indigenous peoples treating infections with creosote compounds. The significance and intrigue about our study is that it shows the value of prospecting for new medicines from plants traditionally used by indigenous people as medicine, said Anjan Debnath, Ph.D., co-principal investigator and an assistant adjunct professor at the UC San Diego School of Pharmacy. The creosote bush, Larrea tridentata, is a tough evergreen bush with small waxy leaves, yellow flowers, and a distinctive turpentine-like scent. Native Americans in both the United States and Mexico have long used the plant for a variety of ailments, including intestinal complaints. There is also an existing body of scientific work documenting the plant's pharmacologically active compounds, notably nordihydroguaiaretic acid (NDGA). NDGA has antiviral, antibacterial, anti-inflammatory and anticancer properties. The study is the first to show that NDGA and five other compounds are active against both pathogenic parasites. In other studies, NDGA has been shown to be a neuroprotective agent. It protects human monocytes and other cells and tissues through its powerful antioxidant activity.